Even though large trucks make up only 4% of all road traffic, 12% of all fatal vehicle accidents involve large trucks. 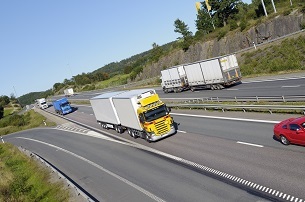 Because large trucks have significant operating limitations (blind spots, longer stopping distances and the need for wider-than-normal turns), it’s essential other drivers respect these limitations by knowing how to take extra steps when driving near them. In this issue, we’ll share information about how you can prepare yourself to drive even more responsibly – and safely – when you find yourself close to a big rig on the highway. Entitled “Our Roads, Our Safety,” the Federal Motor Carrier Safety Administration (FMCSA) has launched a road safety education program to share tips and driving techniques with motorists to use while in close proximity to large trucks. Stay out of truckers’ blind spots. Because of the size of their trucks (usually between 70-80 feet), truckers have very limited visibility on either side of the truck. These blind spots include: directly in front and behind, and along each side – especially the right side. If you’re going to pass, do it quickly. Always pass on the truck’s left side. Don’t linger along the side of the truck. Instead, even if you’re using cruise control, pass promptly. There are two reasons for this. (1) The trucker needs much more time and space to stop, and (2) because the height of the truck cab is so drastic, the trucker may not be able to see your vehicle. Keep your distance – at least a 4-second following difference – when following from behind. If you’re following too closely, the trucker may not be able to see you. If the trucker isn’t aware of where you are, you could rear-end the truck if a sudden stop or adjustment has to be made.